Amazon's Prime service is one of the e-tailer's more compelling offerings. It offers not only free two-day shipping or same-day if you have a fulfillment center in your city, but access to their Prime Video service, access to eBooks & Music, and early access to some deals. However, not everyone is completely sold on buying a year at a time for $99. That price is not going away anytime soon, but it's being joined with some other options. First, Amazon is offering Prime Video on its own for the first time at a competitive rate of $8.99 monthly. That's a little bit less than rivals Netflix and Hulu. There's also available options to add Starz, Showtime, and quite a few others for additional fees. For that price, you get Amazon's full catalog of content including their own shows and exclusives like BBC America's Orphan Black and Doctor Who. 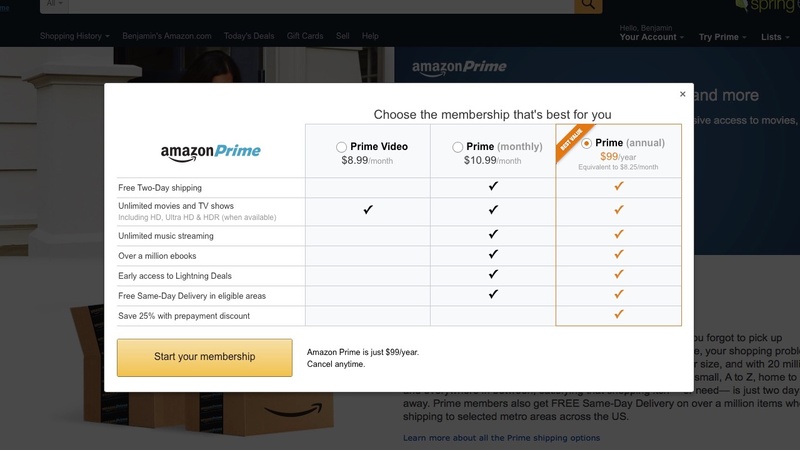 For $2 more a month at $10.99, a full subscription to Prime is also available. While these are available monthly, Amazon does make clear that the original $99 one time early subscription will save you money.